Everyone has an inner fangirl. Your fandom could be anything, really. It could be food, or clothes, or Apple products. Okay, so maybe not Apple products. But, seriously, everybody has something that they get super excited about. Even Disney characters! 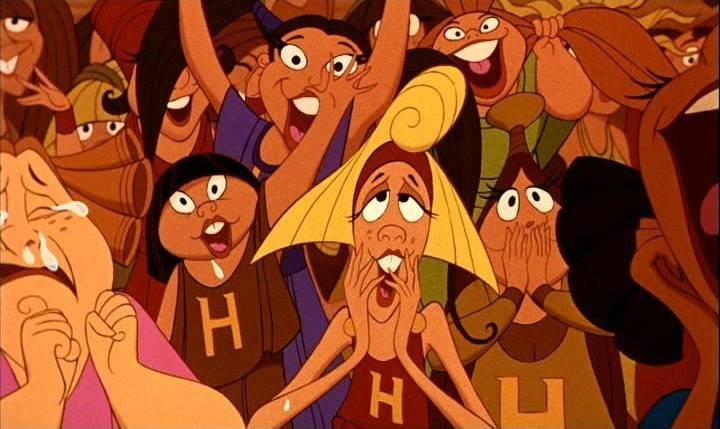 Here are some Disney characters demonstrating the life of a fangirl. "YOU ARE MY NEW BEST FRIEND." "YOU TWO ARE MADE FOR EACH OTHER." "Yeah, have fun with that." "EVERYONE OUT OF THE LIVING ROOM I NEED ROOM TO FLAIL." "I'm staying in my room until the next Marvel movie." "OH MY GOODNESS SO CUTE I COULD JUST SQUEEZE THEIR LITTLE FACE." This was awesome and I can relate to all of these. Hahahaha! This is so great. "MOFFAT." Ha! This is eerily accurate. I was going to comment with my favourite, but I don't think I can actually pick one... Possibly "EVERYONE OUT OF THE LIVING ROOM I NEED ROOM TO FLAIL," because at first I was like, "Haha, this one's hypothetical"--and then I realised. I've done that.